Accounting is a process of accumulating, summarizing and communicating financial information. Financial information can be of different types and serve different purposes, but it all comes from the same function – accounting. 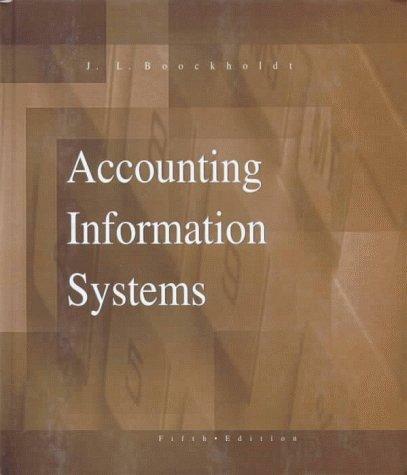 Financial accounting provides information to external users. Such external users can be investors, creditors, banks, regulatory bodies (i.e., Securities and Exchange Commission, Internal Revenue Service, etc.). The information is usually in the form of financial statements (see more on the financial statements below). Managerial accounting provides information to internal users. Such internal users include a company’s managers and employees. The information accumulated and presented by managerial accounting function includes sales figures, gross margin analysis, cost information broken down by product line, etc. As a rule, managerial accounting information provides more detail than the financial accounting information and sometimes includes confidential data not available to external users. Tax accounting can be distinguished as another kind. Tax accounting deals mainly with calculation of taxes (i.e., income taxes, sales and use taxes, etc.). Because rules regulating calculation of taxes are different from those governing financial statements preparation and presentation, tax accounting should be performed separately and in parallel to financial and managerial accounting. Usually, there is a tax department with a company that deals with tax accounting, but works closely with the financial accounting department. Two approaches to recording accounting events and transactions exist. 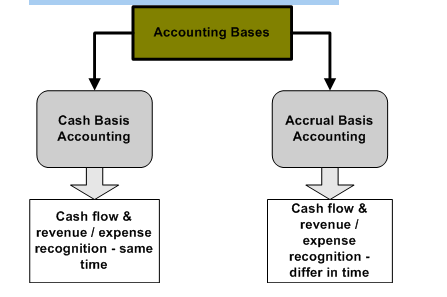 One approach is based on cash flows and therefore called cash-basis accounting. Cash basis accounting implies that any transaction should be recorded in accounting records when cash movement (i.e., payment or receipt) takes place. For example, when a company sells a product on account, no transaction is recorded in accounting books. Only when cash is received from the customer, will the company record the sales transaction. Cash-basis accounting is not permitted under the US Generally Accepted Accounting Standards (US GAAP), which are rules for financial accounting and reporting. However, cash-basis accounting is generally permitted by the Internal Revenue Service for tax accounting purposes (with some exceptions which are beyond this introductory accounting lecture). The other approach is based on the time a transaction takes place regardless of when cash related to the transaction is exchanged. This approach is called accrual-basis accounting. Returning to the example of a sales transaction, the revenue will be recognized by the company when the goods are delivered to the customer and not when the customer pays for the goods. The accrual-basis accounting is required by the US GAAP in preparing financial statements. All transactions are recorded in accounts. Accounts have three parts – header, left side and right side. Because the accounts resemble the letter T, they are called T-accounts. The left side of a T-account is called debit and the right side is called credit. T-accounts are sometimes drawn to understand the relationship between different accounts. Most of the time, however, accounting information is posted directly to accounting journals that accumulate information about specific types of transactions. For example, a journal where all sales are recorded is called a sales journal. The accounting process starts when transactions are posted to the accounting records called journals. The recording process may be manual or automated. The manual process means that a bookkeeper records transactions into paper journals as they occur or at the end of a day, week, or month, depending on frequency. The manual process is not used widely any more. The automated process involves use of the accounting software, where a bookkeeper can enter all transactions, again daily, weekly, and monthly or as needed. Due to the efficiency increase with the automated process, it is the most used nowadays. The process of entering the transactions into journals (whether on paper or in accounting software) represents bookkeeping. The next step in the process is summarization and presentation of the financial information. Again, this may be completed manually or automatically with help of accounting applications. This process is known as accounting. Note that there is no definite separating line between bookkeeping and accounting. Bookkeeping mostly relates to entering and recording transactions, while accounting means preparing the information for presentation of financial statements or other reports. The Income Statement shows the profit or loss for the period. It includes revenues and expenses, which provide the net result for the period. This statement is prepared for the period, meaning it includes all transactions that took place during the period. The Equity Statement shows the capital and other equity accounts of the company and how such accounts changed during the period. The Balance Sheet shows the company’s assets, liabilities and equity as of the end of the period. This statement is prepared as of a date, and not for the period, like the Income Statement. The Cash Flow Statement shows the cash movements during the period. Such cash movements include all cash receipts and expenditures. Accounting for small businesses has its peculiarities. Due to the small size of such companies, there may only be one or several people in the accounting department. Therefore, the same people can deal with financial, managerial and tax accounting. In addition, most small businesses don’t have complicated transactions that occur in larger public companies, such as transactions related to stock options accounting, accounting for derivatives, etc. The best way to maintain accounting records in a small business is to use one of the accounting packages available in the market. For example, QuickBooks and MS Accounting are the ones I can recommend. Somebody in the company can take care of the entire bookkeeping > accounting > financial statements process. Alternatively, the bookkeeping can be performed in-house by the owner(s) or employees, while accounting and financial statements preparation can be outsourced to a CPA who will perform such work for a reasonable fee. People and organizations make decisions based on financial information prepared by accountants. That is why it is important for these people and organizations to understand how accounting information is measured. To facilitate communication, rules are established that business people can use to ensure they compare oranges to oranges. For example, assume a store sells goods. When should an accountant record the sale, at the moment the goods are shipped (accrual accounting) or at the time cash for these goods is received (cash accounting)? Whether the store owner applies the accrual or cash accounting is not important as long as a third rule is established requiring the owner to disclose the method selected for the reporting purposes. Accounting rules in the USA are grouped and called Generally Accepted Accounting Principles (GAAP). Generally Accepted Accounting Principles (GAAP) are common standards that indicate how to report economic events. Financial Accounting Standards Board (FASB) issues Statements of Financial Accounting Standards (SFAS) that comprise a large portion of GAAP. You can find more information about SFAS, their issuance process and current projects on FASB’s website. Other organizations playing a significant role in regulating the accounting profession are Securities and Exchange Commission and Public Company Accounting Oversight Board. The last two mostly regulate public companies, while the first one establishes standards for private companies. Businesses communicate accounting information to the public through a process known as financial reporting. Financial reporting is a process through which companies communicate information to the public. An income statement presents revenues and expenses and resulting net income or loss for a period of time. An income statement is also called Statement of Operations, Earnings Statement, or Profit and Loss Statement (P/L). A statement of changes in equity shows all changes in owner’s equity for a period of time. This statement is also called Owners’ Equity Statement. A balance sheet presents assets, liabilities and owner’s equity at a specific date. A balance sheet is also called Statement of Financial Position. A cash flow statement summarizes information about cash outflows (payments) and inflows (receipts). This statement may also include certain information not related to actual cash flows. All financial statements consist of classes or categories known as elements. There are ten elements: assets, liabilities, equity, contributed capital, revenue, expenses, distributions, net income, gains, and losses (which will be explained later in this or further chapters). Assets are economic recourses of a business used to accomplish its main goal, i.e., increase owners’ wealth. event giving rise to the assignment must have already occurred. For example, if a company has purchased a piece of equipment and uses it in generating profits, it is considered as an asset. However, if the company just considers buying new equipment, it can’t be deemed or recorded as an asset. We need to provide a definition of claims before we proceed with the basic accounting equation. A company’s assets belong to the resource providers who are said to have claims on the assets. Liabilities are debts and obligations of a company. Equity is what the company “owes” to owners. The amount of total assets minus total liabilities equals equity. Because equity equals the difference between assets and liabilities, it is also called net assets. If a company goes bankrupt, liabilities are paid off first to creditors, while equity is the last to be distributed. Therefore, owners’ equity is also called residual equity. Apart from the example above, let us see how different transactions will affect the basic accounting equation. We will take a look at several transactions separately. Note that the amount of this single transaction is recorded twice. The first time it is recorded as an asset and the second time it is recorded as the asset source (equity). Here is a rule: Any transaction is recorded at least twice. This rule is known as double-entry bookkeeping. Double-entry bookkeeping rule states that any transaction is recorded at least twice. Because this transaction provided assets to the enterprise, it is called an asset source transaction. An asset source transaction is one of the four types of accounting transactions. Asset source transactions result in an increase in an asset account and in one of the claim accounts (liability or equity accounts). Equity is usually viewed as a source of assets, and that’s why it becomes necessary to subdivide the owner’s’ interest into two components. First, owner’s claims are established when a business acquires assets from owners. These claims result from the contributions of capital resources by the owners, and therefore they are frequently called contributed capital. Contributed capital is a component of equity resulting from contributions of capital resources from owners. The second source of assets associated with equity occurs when a business obtains assets through its earnings activities and is called retained earnings. Retained earnings form a component of equity resulting from earnings activities. 3) An increase in assets resulting from rendition of goods or services to customers is called revenue. 4) As noted above, assets acquired in operating activities are called revenues. Assets used in the process of generating revenues are called expenses. Expenses decrease retained earnings. Assume Friends Company used $1,000 in assets to earn $3,000 in revenues. This is an example asset use transaction. Asset use transactions result in a decrease in an asset account and in one of the claim accounts (liability or equity accounts). Take a note of how decreases or negative amounts are shown in accounting records. Instead of prefixing a minus sign (“-“), a number is taken into parenthesis. This is a common way of showing a decrease in the accounting realm. Distribution and expenses both result in decreases in retained earnings and thus, in equity. At the end of a period, all accounts are prepared for the next period. It is important to distinguish between permanent and temporary accounts. Balance sheet accounts (i.e., assets, liabilities, and equity) have a continuing nature; thus, they are not closed after each period and that’s why they are called permanent accounts. Permanent accounts are balance sheet accounts. They are not closed each period. Their balances are carried forward into the next period. Permanent accounts are also called real accounts. In contrast, revenue, expense, and distribution accounts are used to collect information about a single accounting period. At the end of a period, amounts in revenue, expense, and distribution accounts are transferred to Retained Earnings. Accordingly, the revenue, expense, and distribution accounts must have zero balances at the end of one accounting period (after closing the books) and at the beginning of the following period. Temporary accounts are closed at the end of each period. These are mostly income statement accounts, except for a distribution account that is equity statement account. Temporary accounts are also called nominal accounts. The process of transferring the balances from the temporary accounts to the permanent account, Retained Earnings, is referred to as closing the accounts or closing the books. The income statement is presented below. We do not intend to go through the preparation of financial statements process at this point. That will be covered in other chapters. The purpose of showing the financial statements below is just to understand how they are look like. The income statement measures the change in net assets or the difference between assets increases and assets decreases. The asset increases from the operating activities were labeled revenues. The asset decreases were called expenses. The difference between revenues and expenses is called net income (if revenue is greater than expenses) or a net loss (if vice versa). Net income is the excess of asset increases (revenues) and asset decreases (expenses) for a period. Note that distributions do not fall under expenses caption and thus are not used in calculating the net income. Net loss is the opposite of net income. Net loss results from the excess of asset decreases (expenses) over asset increases (revenues) for a period. The statement of changes in equity explains the effects of transactions on owner’s equity during an accounting period. The statement includes the beginning and ending balances of contributed capital and reflects any new capital acquisitions made during the accounting period. The statement also shows the portion of net earnings retained in the business. The balance sheet lists assets and corresponding claims (liabilities and equity). Any asset has a source, so assets balance with claims. That is why total assets equal total claims (liabilities and equity). The statement of cash flows explains how the company obtained and used cash during a period. Sources of cash are called cash inflows, and uses of cash are known as cash outflows. Cash inflows are sources of cash; for example, payments from customers, capital acquisitions, etc. Cash outflows are uses of cash; for example, payments to vendors, paying off bank loans, etc. Operating activities section explains cash generated through revenue and cash spent for expenses. Investing activities include cash received or spent on productive assets and investments in the debt or equity of other companies. Financing activities describe cash transactions associated with resource providers (i.e., owners and lenders). To better understand effects of transactions on financial statements and see connections between financial statement elements, a statements model was created. The two forms of such a model are vertical and horizontal. As its name implies, the vertical model arranges financial statements elements from top to bottom on a page. Horizontal, on the other hand, is so named because it arranges financial statements elements horizontally across a page. In the horizontal model, the balance sheet is presented to the left, followed by the income statement, and the statement of cash flows. Let us demonstrate the usefulness of the horizontal model and apply it to the five transactions we covered before. Note that if a transaction does not affect the model, a related cell will show “n/a” in it. In the statement of cash flows, FA means cash flows from financing, IA means cash flows from investing, and OA means case flows from operating activities. With respect to Events No. 1 and 2, it is clear that only the balance sheet and statement of cash flows are affected. There is no effect on the income statement. Furthermore, you can see that Event No. 1 increases assets and equity and that the cash inflow is defined as a financing activity. Event No. 2 has a similar effect, except that liabilities increase instead of equity. Event No. 3 affects three financial statements. Assets and equity increase on the balance sheet. The recognition of revenue causes net income to increase, and the cash inflow is shown as an operating activity on the statement of cash flows. Event No. 4 is the opposite of Event No. 3. Assets, equity and net income decrease. Cash flow statement shows this decrease as an operating activity. Finally, Even No. 5 acts to decrease cash and equity. The cash distribution is not shown anywhere in the income statement. That’s because distribution is not an expense and thus, is not included in the determination of net earnings. Cash distribution is categorized as a financing activity in the cash flow statement. Using horizontal model helps a lot in understanding the effects produced by each event, so it is advisable to use it as often as possible while learning principles of financial accounting. We have discussed transactions that include direct and immediate cash flows. Cash was received in the period of earning revenue, or cash was paid in the period of incurring expenses. This is called cash accounting. Cash (or cash-basis) accounting recognizes the effects of accounting events when cash is exchanged regardless of the time events occur. Cash-basis accounting is not in accordance with generally accepted accounting principles (GAAP). However, more than often another situation takes place. Cash flows do not match with revenue and expense recognition in the books. This situation falls under accrual accounting. Accrual (or accrual-based) accounting recognizes the effects of accounting events when such events occur regardless of the time cash is exchanged. Accrual accounting closely relates to the definition of accounting events recognition. Recognition is the fact of recording an event in financial records (books). A recognition act may occur before or after cash has been collected or paid. The term accrual means that recognition is made before cash is paid or collected. The following illustration will provide a good example of accrual accounting. Candely Services started its operations on January 1, 20X6 when the business owner contributed $3,500 in cash. During the accounting period of 20X6 the owner, Mr. Candely, provided consulting services to customers and billed them $2,800 for such services. By the end of the accounting period he was able to collect $2,000 of $2,800 billed, leaving a balance of $800 due at the year-end. In addition, Mr. Candely incurred $1,500 liabilities for the only employee’s salary. The company had paid $1,000 of this amount in 20X6, leaving a year-end balance due of $500. As of December 31, 20X6 Mr. Candely had outstanding contracts for consulting services to be performed in 20X7 that amounted to $1,600. The owner contributed $3,500 into the business. Assets obtained in 20X6 accounting period through performing services amounted to $2,800 and contracts for services to be performed in 20X7 amounted to $1,600. $2,000 cash was collected from the customers who had been billed for services provided. Salary expense for the employee amounted to $1,500. The employee was only paid $1,000 during 20X6 accounting period for her work (see Event No. 4) and was to receive another $500 during the following period. Let us look at each of these accounting events. 1) Capital acquisition of $3,500 is an asset source transaction. It acts to increase assets (Cash) and equity (Contributed Capital). 2) According to the accrual accounting rules, the $2,800 of revenue should be recognized in 20X6, although only $2,000 of this amount is collected in that period. As you can see, revenue recognition and cash collection do not go side by side (they are separated in time). In our case, the productive activity of Mr. Candely has resulted in an asset increase by $2,800. This asset is called an account receivable. Accounts receivable refer to amounts of future cash receipts that are due from customers (i.e., amounts to be collected in the future). Accounts receivable are shown on the asset side of the balance sheet. Note that the contracts for $1,600 of consulting services to be performed in 20X7 are not recognized in 20X6. The reason is that revenue is recorded only when work is accomplished. Thus we will leave this $1,600 without recording until Mr. Candely provides services in 20X7. 3) Now we will record the collection of $2,000 in cash. Because we have already recorded that amount as an account receivable (Event No. 2), we just need to transfer the amount from account receivable to cash $2,000. Cash account will increase and the account receivable will decrease. This is an asset exchange transaction. Asset exchange transactions occur when only asset accounts are engaged in a transaction. For example, collection of cash on accounts receivable is an asset exchange transaction. Total assets remain unchanged after such transactions. Also make certain to note that in this transaction revenue is not affected. The revenue recognition of $2,800 already happened when we recorded the increase in the account receivable (Event No. 2). If we had recorded revenue again when we received cash, then the revenue would have been recorded twice. This would not be in accordance with generally accepted accounting principles. 4) Liabilities and corresponding expenses can also be recorded before cash is paid (the same accrual accounting). Mr. Candely would recognize salary obligations and expenses in the amount of $1,500 in 20X6. Salary payable represents amounts of future cash payments to employees for work that has already been performed. Such accruals as salary payable are also called accrued expenses. Accrued expenses are expenses incurred but not yet paid in cash. When recorded, such expenses are usually shown in the liabilities section of the balance sheet. Liabilities increase (Salaries Payable) and the equity decreases (Retained Earnings) by $1,500. However, total claims remain unchanged. The expense recognition is a claim exchange transaction. Claim exchange transactions occur when only claim accounts are engaged and impacted. For example, recording salaries payable is an example of a claim exchange transaction. Again, notice that the cash payment does not cause expense recognition. The expense was already recognized in full when we recorded the salary liability. Doubling of the expenses would take place if we recorded the expense again. Finally, the summary of all transactions is presented below. If you would like to check whether your understanding of these transactions is correct, try to perform their reverse identification. That means you look at the accounts and try to identify the type / nature of the transaction without looking at its description. The next step is to prepare financial statements. Expenses can be defined as a decrease in assets or increase in liabilities that result from operating activities undertaken to generate revenue. Similarly, revenue can increase by decreasing liabilities. The statement of changes in equity provides us with information about effects of capital acquisitions and distributions. Capital acquisitions were $3,500. The statement also indicates that net income amounted to $1,300. No distributions to owners took place in accounting period 20X6. The total equity, therein, is $4,800. The balance sheet provides information about the entity’s assets, liabilities, and equity. In our example we have assets: cash in the amount of $4,500, and accounts receivable of $800; liabilities include only salaries payable amounting to $500; and, finally, equity consisting of contributed capital of $3,500 and retained earnings with a $1,300 balance. 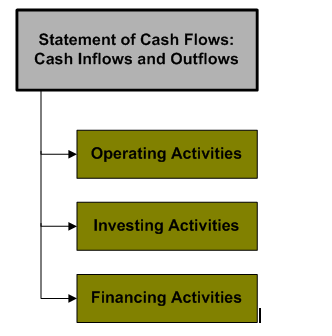 The statement of cash flows explains the movements (inflows and outflows) of cash during an accounting period. Candely Services was established in 20X6. Therefore, the beginning cash balance is zero. Due to consulting services provided by Mr. Candely, the cash account balance increased by $2,000. In the same period $1,000 was spent on operating the business (salary expense). This creates the net cash flow from operating activities of $1,000 ($2,000 – $1,000). In addition, the capital acquisition contributed $3,500 to the cash inflow (financing activities). The combination of these factors explains the $4,500 ($1,000 + $3,500) increase in cash during the 20X6 accounting period. Observe that the amount of net income ($1,300) reported on the income statement is different from the amount of net cash flows from operations ($1,000) as well as from net change in cash ($4,500). This takes place because the accrual accounting is used. Under the accrual accounting, as we stated above, cash flows do not go side-by-side with recognition of events, recognition of revenue and expense in particular. During 20X7 revenue of $2,700 was recognized on account. $3,000 of accounts receivable was collected. Salary expense of $1,400 was incurred. $1,200 cash was paid to settle salaries payable. $500 cash was distributed to the owner. On April 31, 20X7 Mr. Candely’s business invested into a $1,000 certificate of deposit (CD). The CD carries a 6% annual interest and 1-year maturity term. On December 31, 20X7 the company adjusted the books to recognize interest revenue earned on the CD. The table below summaries the effects of the 20X7 transactions on the accounting equation. The first five transactions are familiar to us, so we will go straight to Event No. 6 and No. 7. The purchase of a certificate of deposit represents an investment. The event acts to decrease the cash account and to increase the certificate of deposit (CD) account. As both accounts involved in the transaction are asset accounts, it is an asset exchange transaction. When Mr. Candely invested into a CD, he effectively loaned money to the bank. In return for using his money, the bank agreed to pay back an amount greater than the amount borrowed. The amount initially invested (or borrowed) is called the principal. Excess of money over the initial invested amount (principal) is called interest and is usually set as a percentage to the principal. In our situation, the interest on the CD is 6%. That means that on May 1, 20X8 Mr. Candely will get back the principal ($1,000) and the interest in the amount of $60 ($1,000 x 6%), or $1,060 in total. It is important to note that the interest is earned on a continuous basis even though the payment of investment return is made on the maturity date. In other words, the amount of interest due increases proportionally with the passage of time. When a portion of interest is earned, the interest receivable account (i.e., amount due from the bank) increases along with an increase in the interest revenue account. Interest receivable represents future cash receipts of interest by a company. Interest receivable account is shown on the asset side of the balance sheet. Interest revenue is the amount of interest earned. Interest revenue (or just interest) may be earned on an investment such as a savings account or certificate of deposit. Interest revenue is an income statement account that increases equity. Later, at the accounting period end, the bank will pay interest to the creditor and the creditor (our company) will decrease interest revenue account and increase cash account. We do not recognize interest revenue until the date of financial statements on December 31, 20X7. At that time, a single entry could be made to recognize the accrual of 8 months of interest (from May 1 to December 31). This entry is called an adjusting entry. Adjusting entries adjust the account balances before the final financial statements are prepared. Each adjusting entry affects one balance sheet account and one income statement account. The amount of interest to be recognized at period end represents accrued revenue. Accrued revenue is revenue earned but not yet received. When recorded, such amounts are usually shown as interest receivable in the balance sheet and interest revenue in the income statement. It is time to look at the financial statements for Candely Services for the accounting period 20X7. There is a new element called interest revenue in the income statement. The interest revenue is the amount we recognized by posting the adjusting entry on December 31, 20X7. While looking at the statement of changes in equity, note that there have been cash distributions to the owner ($500) in this accounting period. Two new elements appear in the balance sheet. Interest receivable is the amount due from the borrower of funds (i.e., from the bank) for using Mr. Candely’s money. Certificate of deposit represents the initial amount loaned to the bank that will be returned on the maturity date (May 1, 20X8). In the statement of cash flows, two new elements are introduced. The first is the cash outflow that occurred as a result of purchasing the certificate of deposit. This is a cash flow for investing activities. The second represents the cash outflow for distributions to the owner, which is an example of financing activities. $1,000 cash distribution was made to the owner. On May 1, 20X8 Mr. Candely received the principal and interest on the certificate of deposit when it matured. The business borrowed $2,400 from a local bank on March 1, 20X8. The note carried 10% of annual interest and had a 1-year term. On November 1, 20X8, Candely Services purchased a plot of land that cost $5,000. Due to changes in the land market, the value of the land had risen to $5,600 by December 31, 20X8. At the end of the accounting period the company made an adjusting entry to record interest expense. All the transactions are presented below. When reviewing the transactions, keep in mind that only affected accounts are presented. All other accounts are not shown due to space limitations. Let’s move to the events and their impacts on the basic accounting equation. 1) Event No. 1 is already familiar to us. Cash distribution is an asset use transaction. Both assets (Cash) and equity (Retained Earnings) decrease. The entry will increase assets (Interest Receivable) and equity (Interest Revenue). The transaction is an asset source one. The second effect (2.2 in the table below) the transaction has on the accounting equation is collection of the interest receivable. Remember that even though $40 of accrued interest was recognized in 20X7, no cash was collected at that time. Thus, the collection of cash in 20X8 covers the entire interest amount for 12 months ($60 = $40 + $20). The event acts to increase Cash account and decrease Interest Receivable. Accordingly, this is an asset exchange transaction. The third entry related to the certificate of deposit maturity represents collection of the principal. Recall that on April 31, 20X7, Candely Services bought a CD with a 1-year term from a bank. Respectively, on May 1, 20X8 Mr. Candely’s business should get the invested money back. This transaction increases Cash and decreases Certificate of Deposit account. Both accounts involved are asset accounts, so this is an asset exchange transaction. 3) Event No. 3 is borrowing money from a local bank. This is an asset source transaction. The asset account (Cash) and liability account (Note Payable) increase by a like amount. Note payable is an obligation in the form of a written promissory note signed by the borrower. The note includes the information on the rate of interest, the term of maturity, and collateral pledged to secure the loan. Historical cost is based on the dollar amount originally exchanged to acquire an asset. A historical cost also refers to an accounting principle requiring financial statements to be based on original costs. A liability account (Interest Payable) increases, and equity (Retained Earnings) decreases. Interest payable is a liability account that shows future interest payments for using somebody’s money. For example, taking a long in a bank usually means that the borrower will pay the principal and interest. Such interest is show in the interest payable account until paid. Retained earnings decrease through an increase in the interest expense. Interest expense is the charge that a business needs to take and record when using somebody’s money. Interest expense is an income statement account which decreases equity. Recording the interest expense is a claim exchange transaction. Note that the company did not pay off the amount of interest payable in 20X8, so there were no cash outflows. The company just recorded the interest in the books. All four financial statements for 20X8 are presented below. One new element in 20X8 income statement is Interest Expense. Interest expense represents the amount Candely Services accrued in 20X8 for using money borrowed from the bank. Note that no cash payment for the interest expense was made in 20X8. Therefore, ending Interest Payable balance (see balance sheet below) is $200. In the statement of changes in equity note that Candely Services has a net loss amounting to $180. Liabilities section of the balance sheet includes Interest Payable and Note Payable, new elements introduced in 20X8. Both terms are explained earlier. Note that total assets equal total claims (liabilities and equity). cash receipt from borrowed money (represents a financing activity).